There is wide consensus that our current healthcare system is, to put it mildly, broken. In this time of HMOs, mismanaged care, and a failing Medicare system, patients and doctors alike are dissatisfied with the status quo. But Knope explains that there is a solution - Concierge Medicine. This new system, sweeping the nation yet still the subject of some controversy, allows consumers to contract directly with a doctor to get individualized care. It's a return to Marcus Welby-style medicine, says Knope, and it provides what he calls a critical element for the best care - time. Ample time for doctors to care for their patients, and to restore the doctor-patient relationship that has fallen into the past with our current assembly-line, fast food medicine. 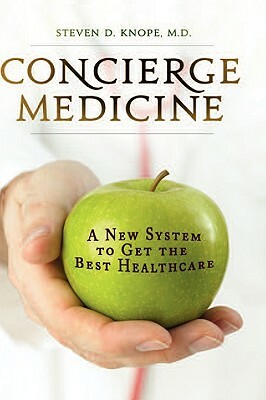 The first book published giving in-depth explanation of Concierge Medicine, this work also provides concrete advice on how to find, interview, and budget for a concierge doctor, using changes in tax law that allow patients to open Health Savings Accounts. Patient vignettes provide personal insights from consumers of Concierge Medicine, and further description of what is involved to use this new approach for optimal health. Knope clearly explains the pressures that led to our current assembly-line healthcare system, allowing the reader to see also why the fact that a typical doctor's visit these days lasts just seven minutes works against any attempt to get, or for doctors to give, the best of care. Health is our most precious asset, says Knope, and like financial wealth, what he sees as health wealth also takes time, effort, and money to nurture. The three critical components of optimal health discussed are: a good relationship with a qualified doctor, regular exercise, and good nutrition. Concierge doctors customize a nutrition and exercise program unique to the needs of each individual. Yet there are detractors who argue Concierge Medicine is unfair, because it allows just those who can afford it unlimited access to a doctor. Knope confronts that question of medical ethics also. This book will doubtless stimulate not only ideas and action, but wide discussion and debate. STEVEN D. KNOPE, M.D. is a board-certified internist and honors graduate of Cornell Medical College. He is a pioneer in concierge medicine, opening one of the first concierge medicine practices in 2000. He has served as Chief of Medicine, Chief of Internal Medicine, and Director of the Intensive Care Unit at Carondelet Medical System in Tucson, Arizona. He is a nationally recognized expert on health, fitness, and nutrition, as well as an accomplished athlete who holds a 3rd degree black belt in Kenpo Karate and has completed four Ironman triathalons.